‘The more you look at birds, the more fascinating they become’. 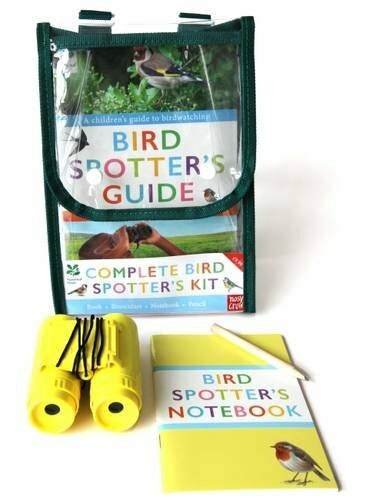 This exciting package includes a book, a notebook and binoculars all fitted into a small, handy plastic rucksack. Young bird watchers taking it on forays into the outdoors will be well prepared to take advantage of special opportunities. The well organised book is divided into two parts: an introduction to birdlife and bird watching skills; a guide to British birds. The first part of the book covers ways of identifying birds, nests and eggs, feathers and flights and habitats. The information goes beyond the superficial but still maintains an inviting, conversational tone. Over a hundred birds are included in the field guide each described under the same clear heading list- size, where and when to see it, what it eats, sounds and looks like. The illustrations of the birds are exceptionally fine and there is a detailed diagram labelling a bird’s parts helping identification and informing discussion. This would make a worthwhile gift for any young naturalist; it is detailed enough to be helpful to children in the later primary and early secondary years.